The Heart and Stroke Foundation released a position statement this week recommending that Canadians reduce their intake of added sugars to help decrease their incidence of obesity and chronic disease. 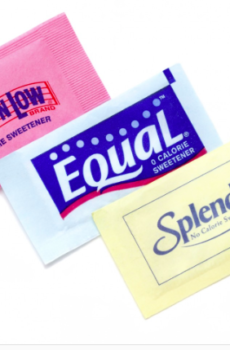 At the same time, the Journal of Nature released a study suggesting artificial sweeteners alter intestinal microbiota, leading to glucose intolerance and concluded that sweeteners are not a good alternative to added sugars. What is one to make of these two apparently conflicting studies, the one advising us to reduce our natural sugar consumption, the other advising that sugar alternatives are also unhealthy? If you look closely at the Journal of Nature’s study, it contains some major flaws. Although the animal research adds to the important body of research on the role of gut microbes in health, when they attempted to test if the animal research was transferable to humans, the research fell short. Researchers used a similar weight-based dose of saccharin on seven human volunteers – far too small a sample to provide reliable scientific data. The human subjects consumed the equivalent of about 40 cans a day of artificially sweetened cola-type drink before developing glucose intolerance. This is a massive amount of pop which few, if any come close to consuming and therefore is not relevant to the average person who consumes a few servings of artificially sweetened beverages a day. Saccharin, the sweetener used in the human study, is not used in any major soft drinks and the study’s author proclaiming his research convinced him to ‘stop consuming caffeinated drinks with artificial sweeteners’ stretches the importance of this work. Until better-designed human studies are conducted we cannot conclude that this research is applicable to humans. Our take on all this? Research on the health or harm of artificial sweeteners has been going on for years. What we do know for sure, is that artificially sweetened beverages do not provide the vitamins, minerals, fibre, protein and phytonutrients necessary in a healthy diet and we do not advocate using artificial sweeteners to replace real healthy food choices. If you are looking for ideas for nutritious and delicious drinks, check out our mouth-watering smoothie recipes. Keep it real. Eat real food!